I developed the PAXE for History Channel’s ALONE competition, and specifically for Vancouver Island. My primary design criteria for the PAXE, (Panacea Shovel-Axe) was that I wanted to have about a 2 pound head axe so that I could easily split the dead Red Cedar, so that I could get inside the log to get the dry wood there. In my mind fire is the most important thing to have on a solo survival trip, because it is so comforting psychologically. I also wanted the PAXE to be as safe as possible to use; so I put a long handle on it so that I would not have to spit wood from my knees. (When it is soaking wet raining, who needs that?) I also, know how handy having a shovel is on a survival trip. It is useful for shelter building and digging for food, roots or in this case clams. I also was not planning on bringing a knife for one of my 10 items. So I put a large beard on the axe so I could reverse grip the axe and use it as a large knife. (I also brought custom broad-heads on two of the arrows that I made. I planned to use as my primary knives for carving and food processing. I did not want to the handle to break, so I designed the PAXE head to have a special super strong ferrule to which I inserted a “unbreakable” plastic, fiberglass reinforced plastic handle into which is epoxied and riveted into place. 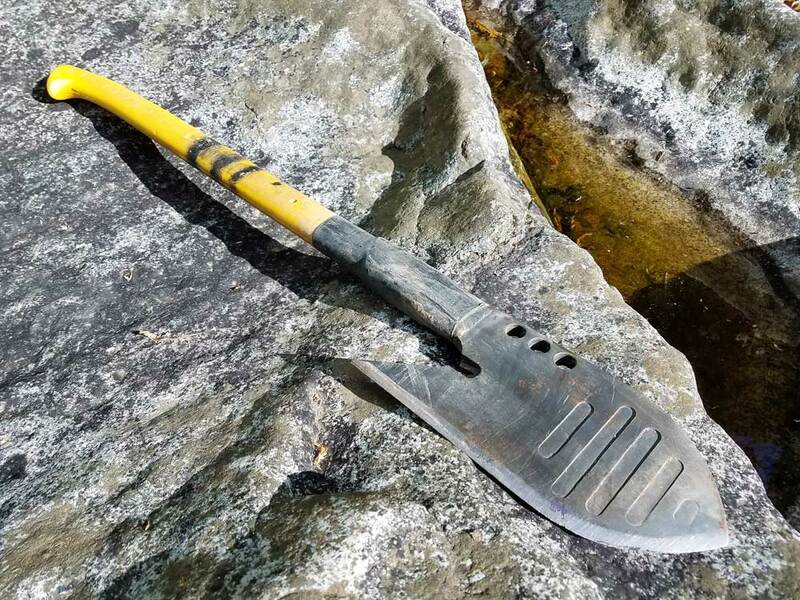 I am calling the ALONE PAXE the PAXE Heavy as it is not really a tool I would put into my bug out bag or take back packing it is designed for ALONE of course or Jeep or Truck camping/ survival. Of course, it would make an excellent recue tool for a bush plane. I plan to release a new version of the PAXE in 2018, it will be a lighter, more compact version. Keep checking back for details!